Running in Bangkok, Thailand. 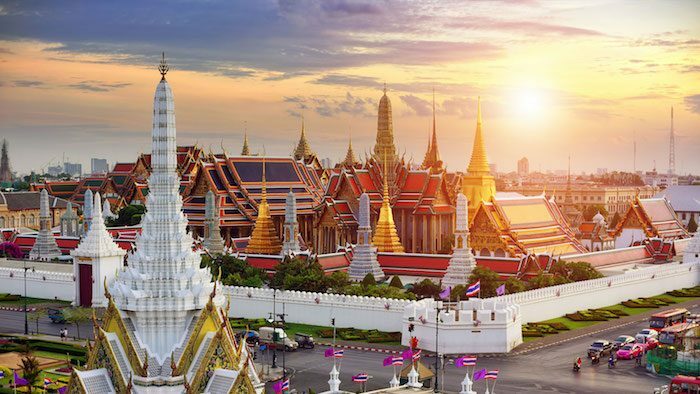 Best places to run in Bangkok. Bangkok is a fascinating city. It’s also famous for being dense, chaotic and hot — not the best conditions for running! You can’t just walk out the door and go for a run. In fact, running on the sidewalks is generally discouraged, since they’re crowded, bumpy, and filled with street vendors. But don’t despair – there are some good spots! 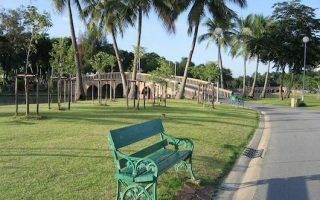 The best places to go running in Bangkok are in a series of parks and green spaces. 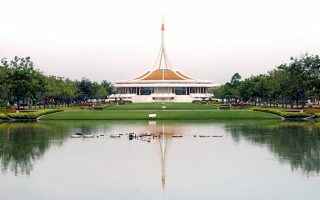 The most popular are Lumpini Park, Benjakitti Park, and Suan Luang Rama IX Park. 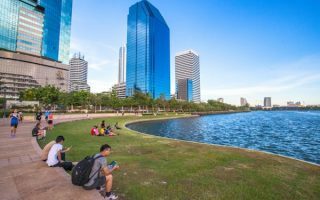 A unique spot is Bang Kachao — an artificial island in the Chao Phraya River, which features a series of paths and roads that are great for running. Runners should note that Bangkok is one of the hottest major cities in the world. The heat and humidity are stifling, and it never cools down, even at night. Between the heat and the traffic, we recommend going early. Bangkok is infamous for its traffic, but public transportation has been improving — there’s the Skytrain and the MRT subway system. Nearly all of our running routes in Bangkok are accessible by public transport. Often referred to as Bangkok's "Central Park". One of the most popular running spots in the city. A 2.5 km track with distance markers. There are lovely gardens and a decent amount of shade. Located in a busy neighborhood right next to the Convention Center, this is another popular place in Bangkok for running. There's a ~2 km paved running path around an artificial lake at the center of the park. Opened in 1998, Santiphap Park ("Peace Park") features pleasantly shaded paths, which are good for running. It's about 1 km around the park, so runners will have to do some laps to get in some distance. 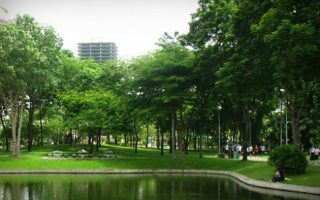 Four co-located parks and gardens make for one of the most extensive off-road running opportunities in Bangkok. Some 6+ km of non-overlapping paths and roads pleasant for running. Butterfly garden, insectarium, botanical gardens. 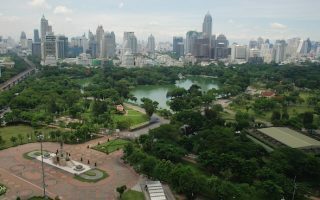 The largest park in Bangkok, with gardens, a lake, and a series of bike and running paths. A lap around the paths is about 5k. The challenge is getting there - no public transport and lots of traffic. But worth the journey. 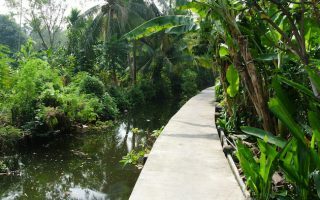 An island oasis in Bangkok, referred to as the city's 'green lung'. It's an extensive area, relatively free of traffic and commercial development. One can put together 15k+ of running on the roads and alleys, including a series of elevated wooden paths. Park 30 km west of Bangkok, which contains possibly the tallest free-standing Buddha statue in the world. Popular for running, as there's a 2.5 km path, which has trees and good views. Three words describe Bangkok’s weather: hot, humid, and wet. Bangkok’s weather is tough for runners. Temps are uniformly hot year-round, with average highs in the low to mid 90s (32-34C), and nightly lows in the oppressive 70s (23-26C). In fact, the lowest temperature EVER recorded in Bangkok is 50F (10C). There is rain on at least 1/3 of days, with 2/3 of the annual total falling in the monsoon months of May-October. Don’t carry rain gear, just be prepared to get wet. And to beat the heat, best to go early. Brooks Running Thailand. Centrally located store. Converse Factory Store. Two locations in Bangkok. Nike. Several outlets. The Nike Siam Square One is the biggest Nike store in Southeast Asia. Ari Running Concept Store. Near King Rama IX Park. Vibrant group with 1,500 members that uses Meetup. A couple of runs each week, including training or events. Sathavorn Running Club. Run by Sathavorn Chanpongsri, the first Thai man to win a medal in the SEA Games marathon, it is absolutely non-competitive, and open for anyone to join. Note: FB page in Thai. Hash House Harriers Bangkok. Bangkok chapter of this worldwide group. They meet Mondays at 5:30 pm, plus a ‘men only’ Saturday run. Great running calendar for Thailand, from Jog and Joy. Run Thailand also has a running calendar…but it does not seem to be updating lately.